In propaganda it was perhaps inevitable that the chess-metaphor would be trundled out like one of those lumbering tanks. Marshal ("Papa") Joffre (left) Commander-in-Chief of the French Army said, in May 1915, that they would win the war in three months (By Gilbert Gauthier, from here). On the right a German counterpart shows Hindenburg and another Chief of the General Staff with other ideas also in 1915: "Schach! Schach! (From here). Many newspapers [etc] have…alluded to the situation in the Dardenelles and in France as that of a “stalemate,” painfully illustrating the adage how dangerous a thing is a little knowledge. No one with any real familiarity with chess would use the expression in describing the war in either if its areas, which would convey the idea that it was all over and that a draw had resulted. A deadlock perhaps at one time would have been a correct definition, but a stalemate is a climax, a finality, and is absolutely misleading. The Germans in this awful contest would jump at a stalemate, but their opponents have got some good “moves” to spring on them at the psychical moment, when the Kaiser will be effectually checkmated – a totally different matter to being stalemated. Are Chess Players at War with Lasker ? It seems strange to British chess players, and especially to those who have met Dr. Lasker, that they must consider themselves in a state of war with him. We wonder what his feelings are in the matter – he is not an ordinary German, being of the Hebrew race, and very cosmopolitan in his experiences and tastes. He has made several long stays in England and the United States. ...and, as if they could take no more, some in the chess fraternity took matters into their own hands - implicating others at the same time. The tie that binds chess enthusiasts could not be subjected to a more severe strain than that caused by the present European conflict. In spite of the war, however, the universal game is the one medium through which the only semblance of friendship between contending nations is maintained. J. F. Magee, Jr., secretary of the Good Companions Chess Problem Club, with 162 members from all parts of the world, informs us that instead of the interest decreasing, the organization is increasing its membership, and that French, Russian, English and German composers continue to compete in the monthly tournaments. Count Guidelli, of Italy, sends Mr. Magee six new problems and writes that he is going to the front next month. Dr. B. Weiss, of Berlin, Germany, also contributes six problems, and there are three entries from Russia by the Kubbel brothers and L.B.Salkind. Hindenburg, who is Germany’s military idol of the moment, is said to be a crack chess player, and it is suggested that the war might be settled by a game between him and Mr. Bonar Law. As the country cranked up its war capability, volunteer recruitment was the order of the day (conscription wasn't brought in until 1916). "Nearly all the members of the City of London Chess Club of military age" wrote Mr. Antony Guest (The Chess Amateur March 1916) "have joined our Forces", and later in (November 1917) it reported the example of 21 members of Bradford Chess Club who had joined up to fight (more examples, from what must be countless others, later in the series). Chess was a popular pastime among the first waves of recruits in the training camps, an enthusiasm hampered by a shortage of chess sets (as well as, according to other accounts, weapons). The mobilisation of the colonies mentioned in the above extract introduces an international perspective on the war preparations; and this story from the American Chess Bulletin of 1915 on that theme enables us to enjoy a reasonable game of chess. A pretty good game in the circumstances - which nicely illustrates one appeal of chess during the war: it "reliev[ed] the dreary monotony of life in the trenches, in the North Sea, in hospital etc." (Mr A. J. Neilson quoted in The Chess Amateur in October 1915). ...One of these ... Teutonic journals is authority for a very interesting little anecdote anent Spielmann…(who) even in the midst of his game with Reti in the memorable last round of the uniquely famous Mannheim tournament, received his military summons…he had to appear before a captain to be assigned…: “What are you?” asked the captain. “Chess player,” said Spielmann….” I am a chess master”. “Is there such a thing and can one make a living thereby?”…“Certainly, if one is a good enough player,” …“Very well, then,” said the officer finally, “we’ll assign you to the artillery in a fortress, where we can make use of your ability as a tactician.” – “The Times-Picayune." ...or worse. After the sinking of the Lusitania by a U-boat in May 1915 German owned shops were attacked. And not just in the mother country either: The Times reported (according to The American Chess Bulletin that year) that in South Africa - another colony that sent troops to Europe - "Johannesburg CC lost all its chessmen, boards, etc., during the anti-German demonstrations last May, the building in which they were stored being among those wrecked by the demonstrators"). Collateral damage, indeed. Many thousands of "aliens" were interned. 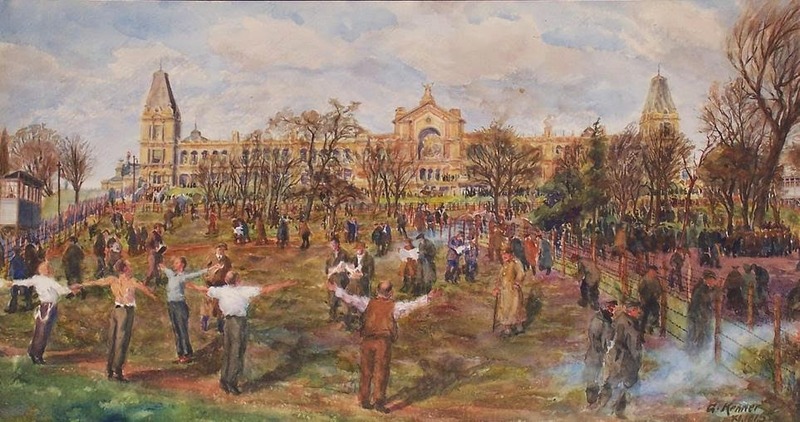 The imposing Ally Pally in North London was turned into an internment camp, as shown in this striking watercolour by German born artist George Kenner. George Kenner (1888-1971). Alexandra Palace as an internment Camp 1915-6. © and reproduced with kind permission of Christa Kenner Bedford. © and acknowledgements as above. 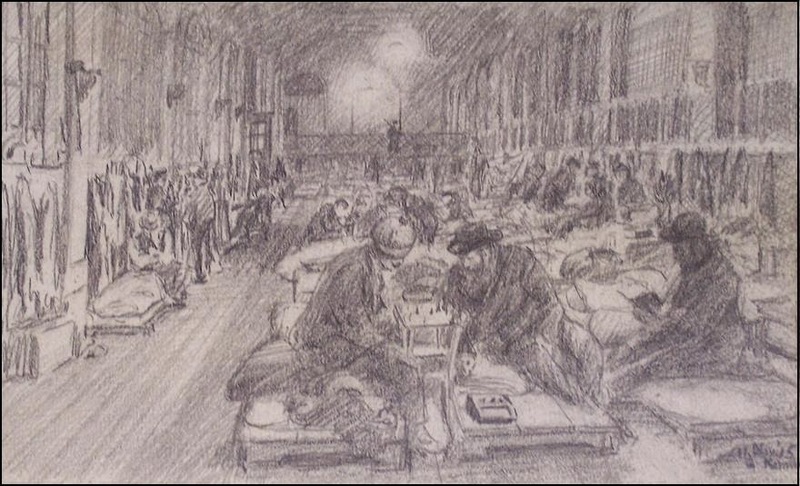 Kenner later set out a detailed account of his detention in which he mentions that "[b]efore bed-time we read, wrote letters, played chess or cards, until the lights were darkened at 10.30 for the nights rest." He was returned to Germany in 1919 as part of a "prisoner" exchange, emigrating to the States in 1927. Thanks to Paul Timson for help with digging out items on this subject, especially from the American Chess Bulletin; and thanks again to Christa Kenner Bedford for her generous co-operation in relation to her father's brilliant artwork. 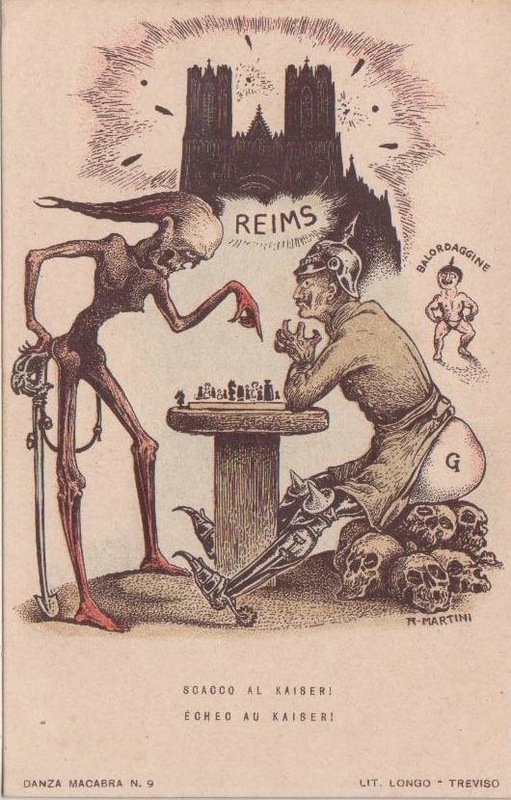 See Tim Harding on chess in 1914 here. Tony Gillam's Mannheim 1914 and the Interned Russians, just published, may elucidate the Spielmann story. This is the section of Diggle's reminicences, in the BCM in 1955, which relate to the War. "Of the coming of the First World War, dislocating the B.C.F. Congress at Chester, and heralded rather weightily in the “B.C.M.” for September,1914, where Europe is announced to be “suddenly steeped in horrifying collisions of opposing national interests and ambitions” and the “B.C.M.,” though “naturally writing from a pro patria point of yiew,” is “imbued with solicitous feelings for a general satisfactory denouement.” Of some prejudice against “enemy” players as the War proceeds, and one chessplaying British subaltern actually carpeted by his Commanding Officer for being seen on a bus discussing the Ruy Lopez with that “dangerous” alien, O. C. Muller. Of foreign chess, except in America, fading from the headlines, and the Mechanics Institute and local correspondence player coming into their own. Of the “B.C.M.” struggling manfully on with lsaac Brown still at the helm, assisted by men of the calibre of Amos Burn, P. W. Sergeant, and B. G. Laws. Of the “silver lining,” well symbolized by the Victory Congress of 1919; "
All Germans and Austrians and all naturalized Germans and Austrians are requested not to use the club during the period of war and until further notice. I'm reminded of the notices that appeared in various English pubs during the Falklands War saying that Argentinians were barred, a fairly painless prohibition since none of the pubs concerned were noted for their Argentinian clientele. Was the same true of the City of London Chess Club? I'm guessing that German and Austrians weren't queueing at the doors then either.